The August 31st meeting was possibly our biggest ever! Medica Corp hosted over 60 members, VARs, Sponsors, and SolidWorks staff at their Bedford facility. Plus, nearly a dozen sponsors contributed a boatload of prizes to our group raffle! We learned a little about homebrewing and a lot about SolidWorks Electrical from Earl Hasz's Brewing with Electricity presentation. Then, Chris Mowatt of https://trimech.com/" target="_blank" rel="nofollow">TriMech taught us how we can use surfacing tools to make better solid models in his Surfacing Tools for Solid Designs presentation. To commemorate this impressive meeting, we've put together a short recap video. Watch it here! It's not too late to https://www.surveymonkey.com/r/swlaunch2018" target="_blank" rel="nofollow">register for the SolidWorks 2018 Launch Event. Hear from SolidWorks execs and developers, attend round table discussions with Product Definition, and take a deep dive into the features of SolidWorks 2018. https://www.surveymonkey.com/r/swlaunch2018" target="_blank" rel="nofollow">Pre-registration is required. This year's SLUGME (SolidWorks Largest User Group Meeting Ever) is scheduled for November 15th, 2017. Expect great presentations from SolidWorks experts across the country, a ton of prizes, and best of all: pizza. We're still looking for a venue large enough to host three of New England's User Groups: BANSWUG, CMA-SWUG, and NHSWUG. Contact us if you have suggestions. At the end of the meeting, the BANSWUG committee raffled off dozens of prizes, generously provided by our sponsors. 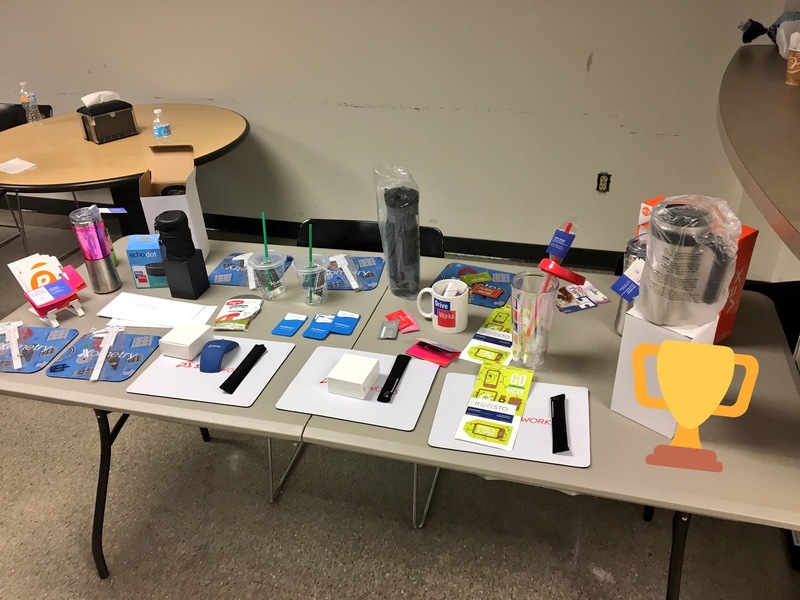 In addition to the trunkful of branded swag, courtesy of SolidWorks HQ, we also gave away nearly $300 in gift cards from our sponsors, as well as an Amazon Echo Dot from DriveWorks, and a robotics kit from https://rapidmanufacturing.com/" target="_blank" rel="nofollow">Rapid! Remember, if you'd like to host a BANSWUG meeting at your facility, or give a presentation during one of our meetings, please contact us! This international conference will be held right in our own backyard! Learn from industrial leaders in 3D CAD, Additive Manufacturing, Laser Scanning and more. 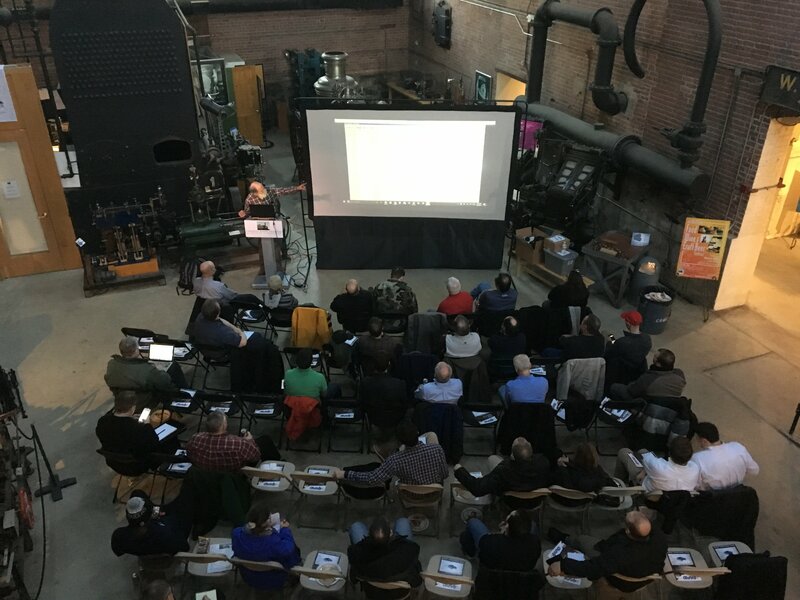 After being postponed due to yet another late-winter Nor'easter, the March 29th meeting of the Boston Area North SolidWorks User Group was held at the Charles River Museum of Industry and Innovation. Surrounded by artifacts from the American Industrial Revolution - designed without the help of CAD tools - our presenters discussed some of the most advanced areas of modern engineering software, from general tips and tricks to API coding to data disaster preparedness. Richard Friedman, volunteer docent at the Charles River Museum of Industry and SolidWorks API expert, presented a brief but comprehensive overview of SolidWorks API tools, including a tutorial on how to record and edit macros for automating model creation. 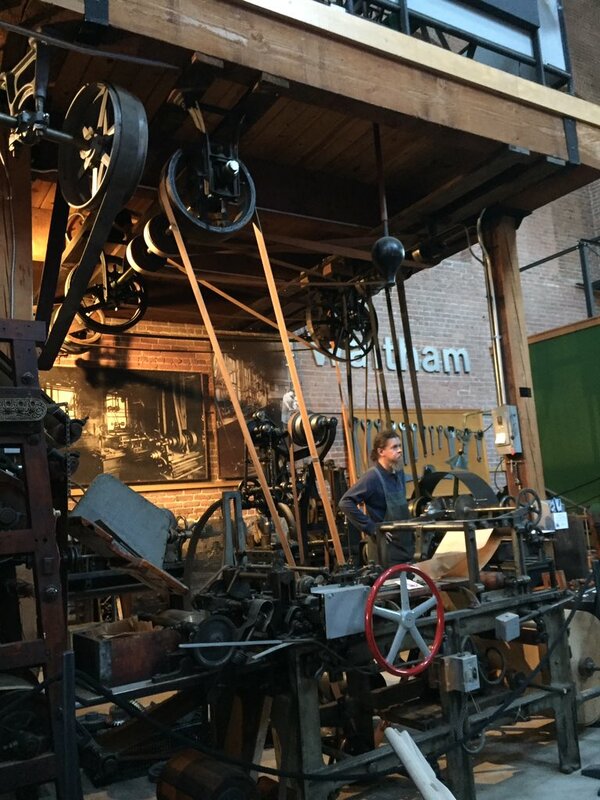 Attendees were then treated to a fascinating lesson on the history of the Charles River Museum of Industry & Innovation by the museum's director, along with live demonstrations of the belt-driven machine shop. Half of the Bacon Brotherhood was also in attendance that night. 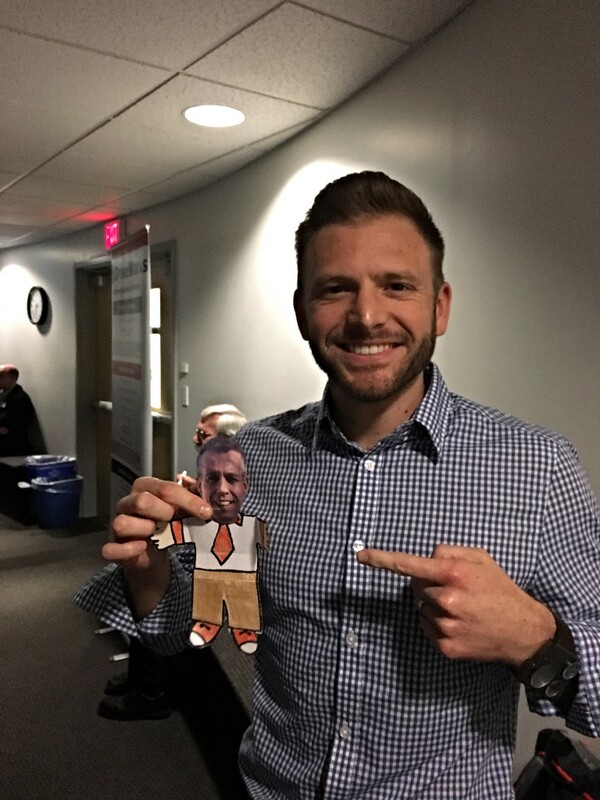 Ed Gebo - ConnSWUG leader, SWUGN Rep, and owner of Digital Detail & Design - gave one part of the acclaimed SolidWorks World 2017 presentation containing several hidden SolidWorks tips & tricks, as well as best practices for preventing data loss in a small business setting. Thank you making our September 22nd meeting another great success, and a special thank you to all of our presenters and sponsors who made it all possible! The meeting was hosted by FLIR Systems in North Billerica. Chris Mowatt, Application Engineer at CAPINC, presented a comprehensive overview of the SolidWorks Visualize tool, including enhancements made in 2017. Heather Hasz, the Stateside face of DriveWorks, introduced us to DriveWorksXpress. This powerful design automation tool is already included in every seat of SolidWorks. 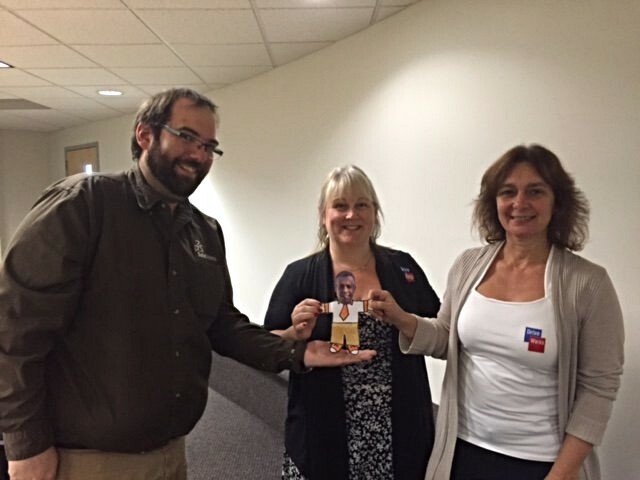 At the September meeting, we were lucky enough to be jopined by several surprise guests! Meanwhile, a few lucky BANSWUG members attended the SolidWorks Product Definition breakout session, where SolidWorks Product Definition Manager Rob Jost previewed several sketching and surfacing features slated for SolidWorks 2018. The feedback provided by BANSWUG members will help SolidWorks refine their products. If you're interested in shaping the future of SolidWorks, don’t forget to sign up for a breakout session for a future BANSWUG meeting. At the end of the meeting, the BANSWUG committee raffled off dozens of prizes, generously provided by our sponsors. In addition to the trunkful of branded swag, courtesy of SolidWorks HQ, we also gave away nearly $300 in gift cards from our sponsors, as well as an Amazon Kindle fire from DriveWorks! Thank you making our June 23rd meeting another wild success, and a special thank you to all of our presenters and sponsors who made it all possible! The meeting was hosted by ITT Technical Institute in Wilmington, in partnership with John Galt staffing. During Paul's double-session, he covered sketch blocks (as a simple way to begin the design of an engine block, suspension system or any system that can be reduced to two-dimensional motion), intelligent patterning (to create fractals), and how to overcome some SolidWorks limitations to create polygons with dozens of sides (while approximating the value of pi). Paul Parise has been using SolidWorks since 1998, to design high technology products and equipment for lasers, optics, electronics and medical fields. At the end of the meeting, the BANSWUG committee raffled off dozens of prizes, generously provided by our sponsors. In addition to the trunkful of branded swag, courtesy of SolidWorks HQ, we also gave away over $200 in gift cards from our sponsors! Our April 27th meeting was another great success, thanks to all of our members. We'd like to extend a special thank you to all of our presenters and sponsors who supported our meeting. The meeting was hosted by https://www.porterchester.com/campus-locations/woburn-ma/" target="_blank" rel="nofollow">Porter & Chester Institute in Woburn. BANSWUG members were lucky enough to get a sneak preview of the new SolidWorks Apps for Kids suite, still in development. SolidWorks portfolio managers Justin Burton and Chin-loo Lama introduced the group to the many different design apps which are being built specifically for kids to start enjoying design and engineering from a young age. One BANSWUG member even brought his kids along for a hands-on demo and feedback session with the developers during the breakout session. They loved it so much, they didn't want to leave! John Nolin, Application Engineer at SolidXperts, presented a host of SolidWorks Tips and Tricks, compiled by SolidWorks developers. At the end of the meeting, the BANSWUG committee raffled off dozens of prizes, generously provided by our sponsors. 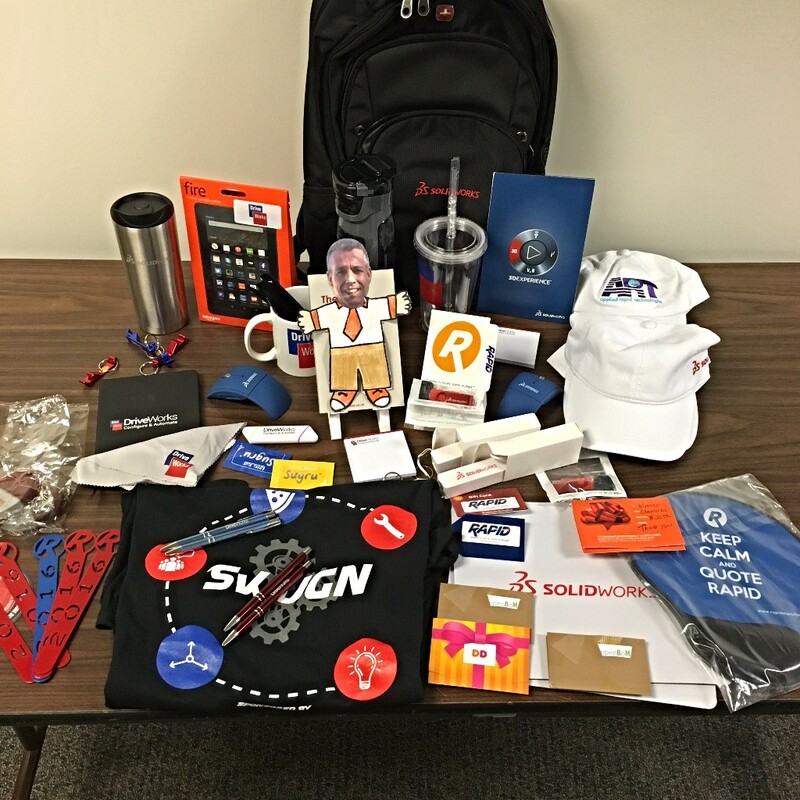 In addition to a trunkful of branded swag, courtesy of SolidWorks HQ, we also gave away nearly $200 in gift cards from our sponsors, as well as special prizes from 3DConnexion and DriveWorks! As seen at SolidWorks World 2014 and 2015, this upstart 3D printing company is now shipping the MARK ONE printer, capable of printing plastics, carbon fiber, Kevlar, and fiberglass composites. The resulting components are as light as plastic but stronger than aluminum. BANSWUG is piloting a new partnership with the SolidWorks Product Definition and User Experience groups! At each meeting, PD and UX representatives will host a parallel breakout session for a select few BANSWUG members (who pre-register on the Eventbrite page). Discussion topics can range from SolidWorks limitations and enhancement requests to alpha testing of new features. See the Breakout Session section below for info on this month's discussion topics. Attendees of this month's breakout session will get a sneak peak at several new functions under development at SolidWorks. Rob Jost: Chamfer/fillet functionality, including hands-on testing of a working prototype build. Jody Stiles: Hole functionality, including hands-on testing of a working prototype build. Don VanZile: An open-ended discussion about Large Assembly performance. Come prepared to talk about your experiences with Large Assemblies. Additional discussion of other concepts, enhancement request, and questions as time allows. "Design tables are traditionally used to manage a family of parts in SOLIDWORKS. We will compare design tables and BOMs and introduce some techniques to represent the family of a part with a BOM." Attendees were also treated to free CSWP exam vouchers. The June 23rd meeting was generously hosted by Jim Santiago at FLIR Thermography in North Billerica. We learned a lot about the awesome technology coming out of their facility. Special thanks also to our great presenters! Follow the links below to download their presentation materials. Welcome back to the Boston Area North SOLIDWORKS Users Group (BANSWUG) We are excited to have Pro Source, Inc. in Waltham, MA hosting our meeting this month.